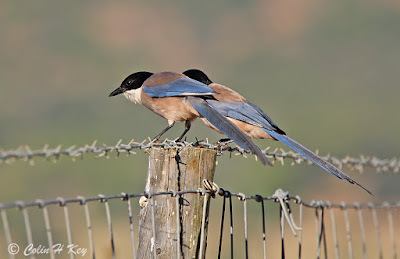 April sees the start of the breeding season for many birds in the Algarve, none more remarkable than the Azure-winged Magpie, which is strongly defying predictions that it may be facing extinction, write Len Port. About the size of a blackbird but appearing bigger because of its multi-coloured body and much longer tail, the Azure-wing’s brash and boisterous behaviour also make it easy to spot. Male and female are identical in appearance and they remain gregarious even though winter flocks are now loosening. Young couples, as well as monogamous pairs that have already bonded for life, will this month be home-building on the basis of a single new nest per tree. In Europe, Azure-wings occupy the southwest corner - the Algarve, southern Alentejo and the neighbouring Spanish province of Andalusia. They are found nowhere else except on the other side of the world - in China, Korea and Japan. Pleistocene fossil evidence has ruled out any notion that exotic Azure-wings were imported from the Far East by early Portuguese explorers. The resident European and East Asian populations were slowly split apart a million or more years ago with the advance of the last Ice Age. Once fairly scarce in the Algarve, they are now flourishing in woodlands, parklands and orange groves all across the region. Their numbers seem to be ever increasing despite an ominous study published some years ago in the international science journal Nature. Researchers forecast that a quarter of all land and plant species in the world might be driven to extinction if greenhouse gas emissions were not drastically reduced. 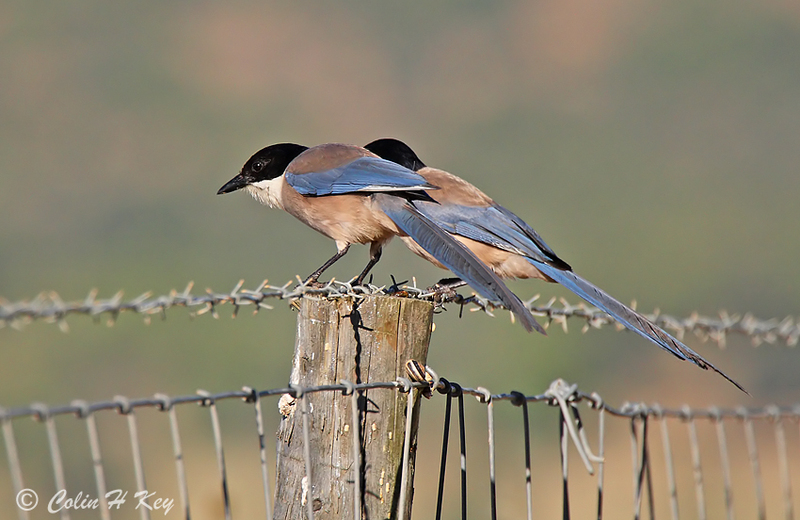 The authors of the study named the Azure-winged Magpie as one of the top ten climatically threatened bird species in Europe. The study predicted a loss of between 50% and 95% of the Azure-wings, depending on their ability to disperse and occupy suitable new areas in response to habitat changes brought about by global warming. While even now they do not care for sparsely vegetated, wind-swept areas and would be forced out by desertification, Azure-wings are extremely adaptable when it comes to diet. In addition to all sorts of creepy-crawlies foraged from trees, bushes and the ground, they enjoy fruits and nuts and are thus regarded by some farmers as a menace. Their popularity is also tainted by the fact that they will take eggs and young from the nests of song birds. Their audacity commonly stretches to swooping into gardens and backyards to raid kitchen scraps or leftover biscuits in cats’ and dogs’ bowls. Cheeky, but as Darwin explained, it’s the most adaptable and fittest that survive. While aggressive in some ways, Azure-wings within their own communities show compassion. Individuals within loose breeding colonies help each other with nest building, supplying food to incubating females and feeding fledglings. Along with other fellow members of the crow family, this is one of the brainiest species in the bird world. Its brain-to-body ratio equals that of the great apes, whales, dolphins and porpoises. It’s only slightly less than ours. Extinction? Not in our lifetime! About the author: Len Port has been a journalist for 50 years, working as a staff reporter, broadcaster and freelance correspondent for many leading news organisations. He covered events in the Far East in the Sixties, and in Northern Ireland and South Africa in the Seventies. Since moving to Portugal in the early Eighties, he has edited regional magazines, contributed to national dailies in Britain and written several books.